In order to ensure the safety of tourists and improve the quality of tourism services in Ha Long Bay, Quang Ninh province has continuously invested and perfected the port and tourist infrastructure, paying special attention to the management and improvement of the quality of tourist boats in Halong Bay. According to statistics of Ha Long City, there are currently 505 licensed cruises in Halong Bay, of which nearly 200 cruise ships offer overnight stay on the bay. To ensure the safety for tourists, Quang Ninh has strengthened the management and improvement of the ships serving visitors in Halong Bay. As the matter of fact, the cruise ships operating in Ha Long Bay has been upgraded over the years with strict technical requirements. In addition to the Government's regulations on handling administrative violations, Quang Ninh also provides separate sanctions and commitments with the shipowners. As a result, the violations have decreased, the ship owners, crew members are more aware, more responsible. Up to now, all cruise ships in Ha Long Bay have been equipped with modern fire fighting equipment and systems, camera systems, and positioning for surveillance by the authorities. In particular, with the navigation system, it is possible to know where the cruise is operating, what it does, and even retrieve the cruise diary on the bay from many days before. In addition, to improve the quality of the cruiser ships, ensuring the safety of tourists, every year Ha Long City People's Committee has a board to evaluate the cruise ships operating on Halong Bay (including the provincial departments of Transport, Tourism, Natural Resources and Environment, Water Police, Fire Prevention and Fighting Police...) to inspect and evaluate the quality of tourist boats operating in Ha Long Bay. In the course of inspection, special attention should be paid to the ships which have been converted and repaired, if they are of good quality, meet the standards and the time limit, thus ensuring their safety. From 2015 up to now, Halong City has eliminated 34 tourist ships (17 day boats, 17 overnight cruise ships) due to the failure to meet the conditions and criteria for operation on the bay. This is a step to improve the quality of cruise ship management in line with international standards. Along with enhancing the management of the cruise ships operating in Ha Long Bay, the quality of tourism services in Ha Long Bay is always improved. The provincial People's Committee has instructed functional units to regularly disseminate to organizations and individuals dealing in transportation of tourists on temporary regulations on the management of cruise ship activities and other regulations, safety, security, fire prevention, food safety, tourism business environment...At the same time, to direct functional branches to intensify the implementation of a number of programs to strictly inspect and handle infringing cruise ships. In addition to investing in upgrading the facilities of the ports, anchoring areas at overnight spots, ensuring the safety conditions for tourists and ships, the functional units enhance the coordination with the concerned branches in inspecting and ensuring security and order, safety and environmental sanitation at the ports. 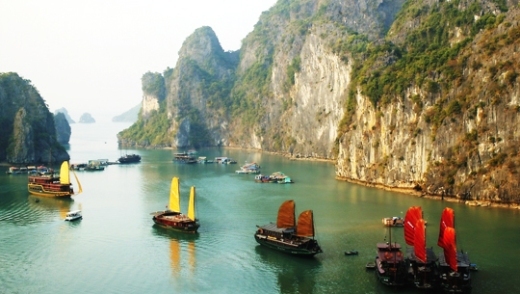 In Ha Long Bay there are five tourist routes, of which route 5, connecting Ha Long and Cat Ba island. To promote tourism linkages between Quang Ninh and Haiphong, from 2013, Ha Long City and Cat Hai District, Hai Phong City have created regulations to coordinate management and conservation. and promote the value of Ha Long Bay and other bays in the Cat Ba Archipelago. In order to strengthen the management and supervision of the ship crews, to improve the behavior of tourists, the quality of services, ensure the safety of cruise ships and tourists visiting Ha Long Bay, for the boat operators, provincial authorities strictly implement the detailed content of the Ministry of Culture, Sports and Tourism Ministry of Tourism's Code of Conduct "Ha Long smile". The cruise ship owners shall intensify the propagation, dissemination and fostering of knowledge and skills for the crews on tourist ships, crew members and employees working on tourist ships on traffic law provisions. Inland waterways, regulations on codes of conduct, culture and civilization in tourism service business; At the same time, measures should be taken to strengthen the management of crew members and staff working on board cruises. With the tightening of the management, the business of cruise ship services in Ha Long Bay has gone into good order, material facilities and equipment to ensure safety, fire prevention and explosion have been equipped. The quality of service and professional awareness of the crew members is increasing. The strict sanctions imposed have created a high deterrent, revented violations and limited recidivism, the incident associated with the cruise ship is clearly reduced, no serious incidents have occurred to the lives of tourists and crew members, cruise ship employees. Thus, it contributes to creating Ha Long tourism brand - a safe and friendly destination.